The under 8s played their first ever cricket match today, a friendly against our own Under 9s . 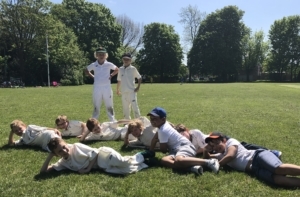 It was perfect weather at Wimbledon Chase School and the spectators got to enjoy a good standard of cricket across both teams, bags of energy and enthusiasm and a little bit of ‘flossing’ in the field! The boys had a lot of fun and it was great to see them enjoying their cricket so much. We wish both teams the best for the upcoming season ahead!